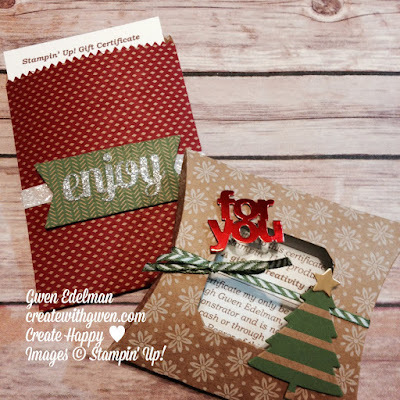 Create with Gwen: Stampin' Up!-The the Perfect Gift! Stampin' Up!-The the Perfect Gift! Let Santa know what you really want! with Create with Gwen Stampin' Up! Gift Cards! Are you a prepared holiday shopper or always wait till the last-minute? Gift cards are perfect anytime! Want one for yourself? Send Santa to me, your Stampin’ Elf! I’ll help fill up your craft room shelf! Stampin' Up! Gift certificates from Gwen Edelman, Create with Gwen, are available in amounts of $50, $100, or more! Redeem during Sale-a-Bration (Jan 5-Mar 31, 2016) and get a FREE Sale-a-Bration product for every $50 spent! Excludes tax and shipping. Enjoy! and Have yourself a Merry Christmas!